Chris’s Gigs is delighted to offer a Gig of Two Halves. This will be a very special concert with two distinct performances from two very different artists. 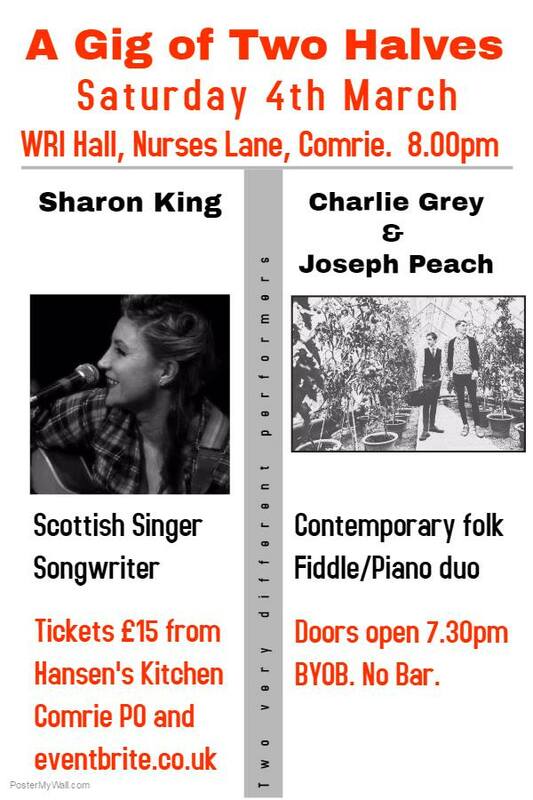 We welcome back to Comrie, Sharon King, the award winning Edinburgh singer songwriter, who so delighted the Comrie Audience when she performed with her Reckless Angels several years ago. This time on a solo tour, she uses her thoughtfully eloquent vocals and astute observations on Scottish life to delight us, through her beautifully crafted contemporary songs peppered with tales of her travels. Be prepared to be moved and entertained. Charlie Grey and Joseph Peach, are two young and precociously talented traditional musicians who are currently in the semi finals for the BBC Radio Two Young Folk Award, to be held in Kendal on the 22nd Jan 2017. We’ll know by the gig time how they got on! Their background lies at the heart of some of Scotland’s native musical traditions, but the music they play is as much based on self-penned material as it is informed by this upbringing. A captivating fiddle style supported by sensitive pianism isn’t big, loud, in-your-face music, but something to be relaxed in to. It’s a journey, rising and falling with total spontaneity.